This handout photo released on August 17, by the Gimhae National Museum, shows a wooden oar unearthed from beneath a shell mound in Changnyeong, 240 kilometres (144 miles) southeast of Seoul. 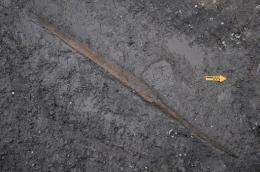 South Korean archaeologists said that they have unearthed a Neolithic year oar, believed to date back about 7,000 years. South Korean archaeologists said Tuesday they have unearthed a rare neolithic period wooden boat oar, believed to date back about 7,000 years but still in good condition. The oar was discovered in mud land in Changnyeong, 240 kilometres (140 miles) southeast of Seoul, the Gimhae National Museum said. "This is a very rare find, not only in South Korea but also in the world," museum researcher Yoon On-Shik told AFP. "We have to check with Chinese artefacts to confirm whether it is the oldest watercraft ever found in the world." One of the oldest boats or related artefacts was found in China's Zhejiang province in 2005 and was believed to date back about 8,000 years. The oar, which was found intact in its entirety, is 1.81 metres (nearly six feet) long. "The oar was well preserved because fine mud layers completely blocked oxygen from decaying it," Yoon said. It was uncovered on August 11 at a site where experts in 2004 unearthed the fragments of what is believed to be two up to 8,000-year-old canoe-like boats, which are believed to have been 13.1 feet long in their original state. The oar and boats were made from pine trees, Yoon said. The technique that made them indicate there might have been a certain form of neolithic period trade using boats between Japan and the Korean peninsula. "With this set, we can picture trade between the Korean peninsula and Japan, sailing techniques and a lifestyle back then," Yoon said, pointing to a similar find in Japan. Japanese archaeologists discovered an oar, believed to date back about 6,000 years, on the Sea of Japan (East Sea) coast in 1999.